Al’s Plumbing, Heating & A/C provides full service plumbing maintenance, repairs and replacements for every plumbing component in your home. Al’s sells and installs Rheem Professional Series gas & electric water heaters, and tankless water heaters. Al’s Plumbing, Heating & A/C is near your home in Plano, Allen, and Frisco. We service all homes in southern Collin and Denton Counties with no additional travel charge. 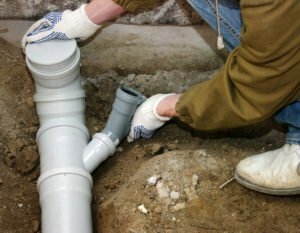 Though called different things, such as Trenchless Pipe Repair or Cured-In-Place (CIP) Pipe-Lining Repair, the process is much the same, and varies only slightly based upon the brand of the pipe-lining installed. A technician inserts a camera into the sewer pipe. The problem is identified by looking at the inside of the pipe on a monitor. A Flexible Lining Is Saturated With Resin and then pushed into the damaged area. The Flexible Lining cures into a hard surface that forms a new pipe inside the original pipe. The process takes a few hours and requires no digging. This method can do spot-repairs or the entire sewer pipe system. This system can also do repairs on water pipes. Cast-Iron pipes (under the home) rust from inside to outside. Clay sewer pipes (in the lawn) attract tree roots because they leak a little at their connections. Tree roots invade the pipe at a connection and continue to grow until the pipe, clogs, cracks or bursts. Depending on severity, the roots may be able to be removed with commercial drain clearing equipment. It’s also common that Clay sewer pipes can become damaged by Expansive-Clay Soil. The entire DFW metro area is built upon Expansive-Clay Soil (this is why DFW homes can’t have basements). Expansive-Clay swells up when it gets wet and shrinks in size when it gets dry. This can cause upward & downward movement of horizontal sewer pipes in the lawn. Copper water pipes degrade due to corrosion on the outside. Today’s sewer pipes (under the home and in the lawn) are made of PVC (Poly Vinyl Chloride). It’s a very durable plastic pipe with an estimated lifespan of 100 years. 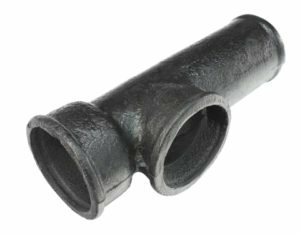 In homes built before 1975, it’s common the pipes under the home are Cast-Iron. The pipes in the lawn are clay. 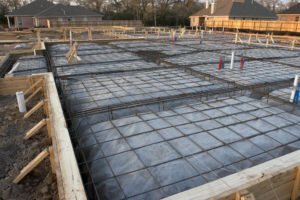 SHOWN: Home Slab Foundation Ready For Cement. 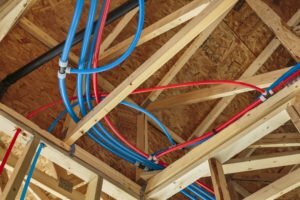 PEX flexible water lines begin widespread use in the 1990’s in new construction homes. Also in the 1990’s, PEX started being used to replace failing copper pipes in existing homes. Copper water pipes have a lifespan of up to 50 years in a slab foundation home. Acidic water (also called “aggressive” water) or soil can cause corrosion and shorten the lifespan of copper pipes. Corrosion will result in “pin holes” — meaning the corrosion has made it all the way through the pipe. The most likely reason for a slab leak in a DFW home (with copper water pipes) is a cracked water pipe due to slab movement. 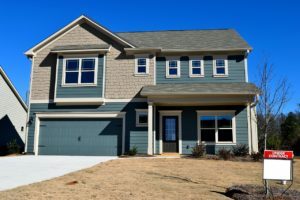 To minimize this risk, a “Slab Watering” program must be implemented to minimize slab movement due to changes in soil-moisture around the edges of the home. CIP Pipe-Lining Offers Benefits As An Alternative To Replacing The Pipe. Non-Invasive — No digging up the lawn or under the home. Does CIP Pipe-Lining Last As Long As Replacement Pipe? CIP Pipe-Liner Warranties Are: 12 Months — 50 Years. Do your research to find reviews on companies who install CIP Pipe-Liner in your area. Reviews are easy to get feedback about the quality of a contractor’s work. Don’t depend on reviews on the contractor’s website. Look for Google Reviews. In most cases, if you do a Google search for the name of the contractor, you will see their Google Reviews. Do this for all contractors you are considering before you choose a contractor. If one contractor does not have Google Reviews, limit your selection to those who do. Get a copy of their written warranty before signing a contract. 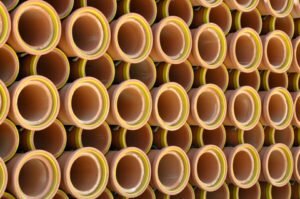 New PVC Sewer Pipe Warranties Are: 5 Years — With An Estimated Lifespan Of 100 Years. New PEX Water Pipe Warranty Are: Up to 25 Years. NOTE: Al’s Plumbing, Heating & A/C does not endorse any specific CIP Pipe-Liner only because we don’t have complete knowledge of all products available. NOTE: Al’s Plumbing, Heating & A/C does not endorse any specific PVC or PEX pipe only because we don’t have complete knowledge of all products available. Al’s Plumbing, Heating & A/C provides full service plumbing maintenance, repairs and replacements for every plumbing component in your home. Al’s sells and installs Rheem Professional Series gas & electric water heaters, and tankless water heaters. Al’s Plumbing, Heating & A/C is near your home in Murphy, Wylie, and Rowlette. 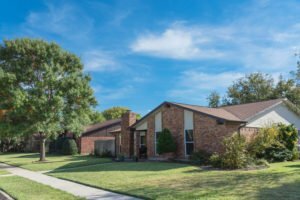 We service all homes in southern Collin and Denton Counties with no additional travel charge.